ANHLGT is a non-Profitable, Non-Religious and Non Political organization. The main aims of ANHLGT are green, clean, beautiful, safe and healthy Sub-City. The association started with four members in sector 23, Dwarka initially for the maintenance of Parks. 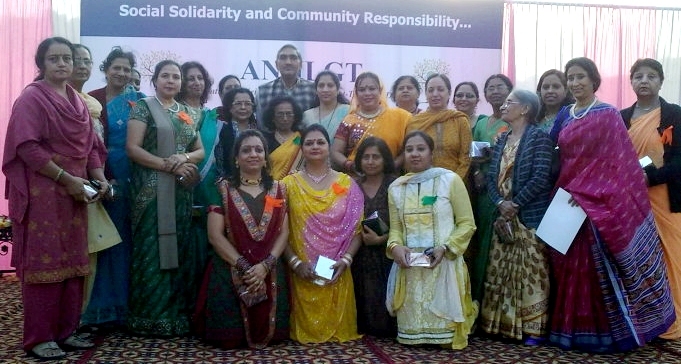 At present ANHLGT is one of the biggest organizations in Dwarka and has 1000 registered members. Now the organization has a reach in almost all the sectors in Dwarka. Dwarka a sub city has a population of 6 lacks people. The organization has made positive changes to the quality of life of people and deals directly with the top ranking officials of various organizations like DDA, MCD, BSES, Police, DTC, etc. Many positive changes have come, through with the initiatives that have been taken by ANHLGT like regular desalting of drains, spraying and defogging of mosquito population , introduction of bus services, bus sheds, increasing police beats, improving infrastructure like relayig of roads ,proper lands capping, maintenance of parks, regular pick up of garbage, sanitation issues etc. Mr. Rajesh Gehlot, Ex. Deputy Mayor of Delhi, Board member, DDA and municipal councilor was the Chief Guest. The chief guest gave away the prizes to the children who participated in the children’s day celebration in different sports, Drawing and painting competitions. Children from Holy Family orphanages from Mahavir Enclave and Najafgarh also received prizes for participating in the completion. ANHLGT gave Basis Life Support training with the help of Columbia-Asia hospital. 80 ladies sand 60 students from Govt. Co-Ed. High School, Pochanpur, Paramount International, sector 23 and Mount Carmel in sec 22 attended the programme. They were also given certificates on this occasion. ANHLGT is having two co-coordinators in every society throughput Dwarka. The event co-coordinators were given prizes for their best performance for promoting ANHLGT’s mission and motto. There were cultural programs like Dandiya(Folk dance from Gujarat), Gidda ( Punjabi dance),Performance by kids from Orphanage –Holy Family, Asha Niwas , Students from Pochanpur, Kerala dance –Kai Gotti Kali, Organized by Ayyapa Seva Samiti , beautifully choreographed by Mrs Ramesh. Some of the participants are active members of association including Mrs. Geeta Nayak resident of Sec 22, Mrs. Lakshmi Suresh Resident of sector 1, Sindhu Sudhir resident of pocket 13, Dwarka. Mr.Robin Sharma , President of Dwarka Vyapar Mandal and Mrs Tina Sharma Member BJP,Dwarka State and Lyons Club, dwarka were also present at the occasion. Governing body of ANHLGT has three Malaya lee members. President Mrs.Cicily Kodiyan, Secretary Mrs. Shameera , Treasurer Mrs Mini George, Joint secretary Mrs. Promilla Mallick and Malashri Singh , along with other four executive members. ANHLGT as a part of their social commitment is working with orphanages Holy Family, Asha Niwas in Mahavir Enclave and Najafgarh. Holy family was represented by Sister Lily Cheriathe. In the end, the President thanked all the participants and the main sponsors of the event Colombia –Asia Hospital and Therapy Ayurveda who also gave away three lucky dip.